To help ensure maximum particle retention, the contaminated oil enters through the metering jet at a low, measured flow rate. The oil then passes through the replaceable filtering element, where total base number (TBN) additives are replenished and the unbleached, long-strand cotton fibers, tightly compressed to resist channeling, trap particles to below one micron and neutralize acids and sulfur compounds. The filtered oil then enters Puradyne's oil filtration system's heated evaporation chamber, where fuel, water, and glycol are evaporated and immediately vented. After dangerous contaminants are removed, the clean oil is gravity-fed back to the crankcase. Proper viscosity is maintained and oil additives remain well within acceptable limits. The system is a bypass system that does not affect the engine's oil flow or pressure. It does not replace the conventional filtration system, it is designed to improve and work in conjunction with it. 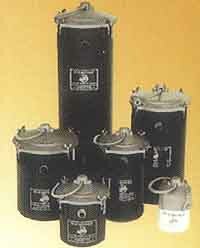 Puradyn Filter Technologies, Inc., 3020 High Ridge Road, Boynton Beach, FL 33426. Tel: 561-547-9499; Fax: 561-547-4025.